I walked in the door, and immediately I was surrounded by stuff. Old stuff, and not-so-old stuff. Furniture, and art, and china, and knick-knacks, and jewelry, and just… big rooms full of stuff! And I knew I had to have some of it. But I had no idea how to make that happen. Could I just buy things like at a store? No, I was told. It will all be sold at the auction, and you have to bid on it. Four terrifying words: You Have To Bid. Gulp. I was embarrassed to admit, I was afraid to bid. How would I know when to bid? How would I know what I was bidding on, and how much I was bidding? Did I have to start with a price? How would I know if I was the winning bidder? What happens if I scratch my nose, would they think I was bidding? Around and around and around in my head. Relax, they said. Our auctioneers know a scratch is just a scratch. Watch and listen for a while, and you’ll get the hang of it. And you know what? Bidding really is pretty simple, and not (too) intimidating. I looked around the auction rooms and saw a couple pieces I really wanted to own. I looked them over, and thought about how much I was willing to pay. I found a good spot in the grouping of chairs near one item I wanted and sat. I watched and listened to the auction, and I started to get the hang of the auctioneer and to understand the prices. When the item was right, I made my move. I waited for the staff to pick up my the item. I listened to the auctioneer ask for bids. The price sounded good to me, but I hesitated a second or two to see what would happen. Nothing. I looked around to see if anyone else was interested. No one seemed to be, so I slowly raised my hand and my green bid card. The auctioneer pointed to me and then immediately asked for a higher amount, looking around the room. I put my hand down. Was that it? Did I get it? 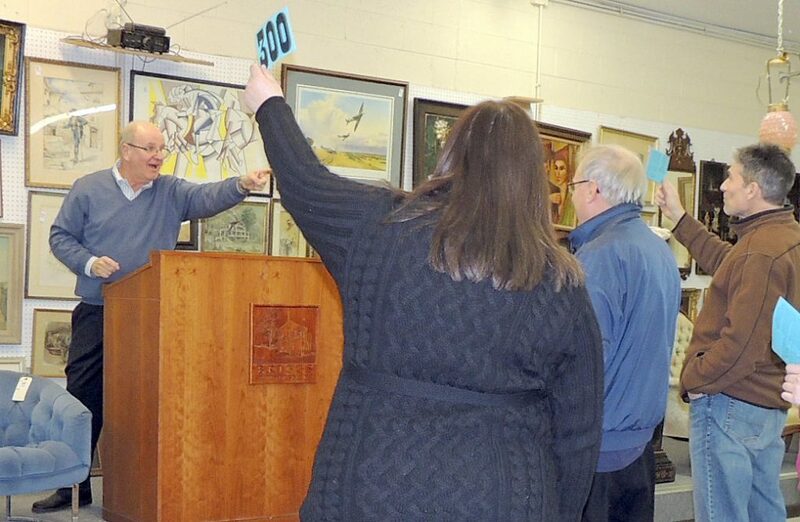 No, the auctioneer pointed to someone way back on the right, then swiveled back to look and point to me, asking for a new higher amount. Yes, I decided, I really want that thing. So I raised my hand. The auctioneer nodded, and looked away, back to the right of the room. My heart was pounding. Would anyone bid more? The auctioneer kept asking for the same new amount, just a little higher that what I had agreed to. No one was bidding! The auctioneer looked around the room, still asking for that same amount, but no one bid! Then the most amazing part: the auctioneer pointed to me and said SOLD! And I realized I had just won my first bid! I was so excited, I could not wait to bid on something else! And that’s when I realized: I had caught Auction Fever.